According to the manufacturer PR Bars have the perfect ratio of carbs/protein/fat, that optimizes your performance by controlling blood sugars and using body fat for fuel. 6 out of 9 flavors are gluten free. All bars are all natural and formulated to sustain energy, so it’s a great choice if you’re training for your first 5k or even the Olympic Games. 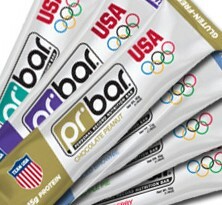 PR Bar is the official nutrition bar of the U.S. Olympic and Paralympic Team. INGREDIENTS: PR Protein Blend [soy protein isolate, soy crisps (soy protein isolate, rice flour, salt), whey protein concentrate, casein, calcium caseinate], fructose, corn syrup, coating [sucrose, fractionated palm kernel oil, whey powder, nonfat dry milk, yogurt powder (cultured whey and nonfat milk), soy lecithin, vanilla], canola oil, cinnamon drops (sugar, palm kernel oil, cinnamon, whole milk, nonfat milk, palm oil, soy lecithin, natural flavor), glycerin, chicory fiber, natural flavors, caramel color, citric acid. Nutrition facts based on Chocolate Peanut flavor. Facts and ingredients vary by flavor. 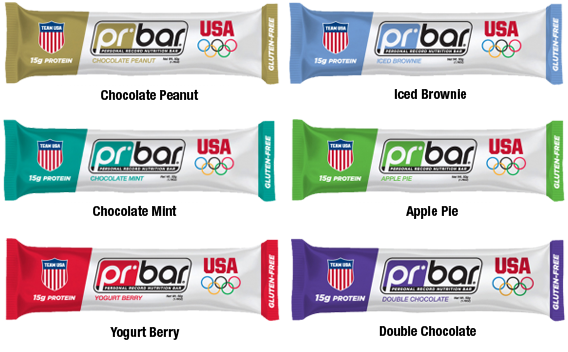 PR Nutrition’s PR Bar is the Official Performance Nutrition Bar Licensee of the U.S. Olympic and Paralympic Team. This bar is getting picked up by many runners, probably because of the audience that PR Bar targets with their advertising. PR Bars are being eaten as a mid-morning/afternoon snack or to substitute a part of breakfast in order to not have a full stomach, if people are working out or go for a run afterwards. It’s nutritional profile is definately valued by many active reviewers. While most people are raving about PR Bar’s flavors, others describe it as bland or average. However, you can’t rely on other people’s taste buds and have to remember that some reviewers judge a line of bars by tasting one single flavor or because they got a free box of bars by the manufacturer. So you’ll have to find out yourself, if the nutritional profile and flavors appeal to you and your diet. PR Bar offers a good variety of flavors and some granola flavors on top of that. However, the granola flavors are not gluten free and have therefore been excluded from this review. Buyers describe the texture as soft and dense, unless you buy one of their granola versions. Attention: The Granola flavors are not gluten free, so we did not list them in this review! With 200 calories, which is normal for this kind of protein bar, it is not a snack bar, but a nutritious addition to your diet. 15 grams of protein is a great amount for in between meals for both men and women. The amount of sugar (22g) is higher than average, but it also what you might be looking for if you are riding the bike a lot or running a 5k or half marathon. Some buyers that are looking for non-GMO bars had concerns about the soy protein in PR Bars and would like it to be more whey instead of soy. $2 for a bar at retail price is not cheap, but an average amount for the amount of protein that you get. You’ll have to do some digging on the internet to find sites that carry this bar. We came across Roadrunner Sports that offered the lowest price. 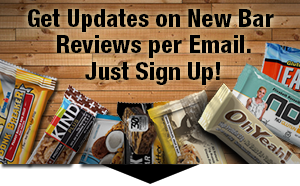 If you can find this bar in the store, wait for a coupon, special or maybe sign up for the PR Bar email newsletter and wait for a promotion.